Kubrat Pulev on Saturday landed himself in soup following his seventh-round knockout of Bogdan Dinu. Following his 27th career win, Pulev was being interviewed by Jenny Sushe, a female reporter for Vegas Sports Daily. After being asked if he would consider fighting Tyson Fury should the former lineal champion get the better of his upcoming opponent Tom Schwarz, Pulev said yes before doing what nobody saw coming: he forcibly planted a kiss on Sushe’s lips. Sushe laughed off the incident, saying ‘Jesus Christ’ while visibly struggling to com to terms with what had happened. No wonder, social media users were quick to show their anger, touting the incident a ‘sexual assault’. “That’s got to be one of the most disgusting things I’ve seen in ages,” one person wrote. “This is not ‘Alpha as f***’, it’s called sexual assault,” read another comment. 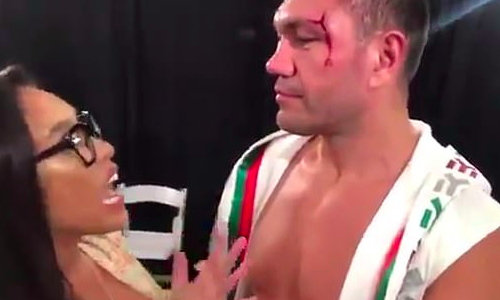 Earlier in the evening, Pulev, whose only professional defeat came at the hands of former kingpin Wladimir Kltschko in 2014, endured a nasty cut above his eye before stopping Dinu in the seventh. At the time of stoppage, two judges had it 57-57 while one had Pulev one round ahead.